Your blog must be having more than one labels or categories, and when a visitor visits your blog from search engines like Google or Yahoo, then most probably he/she will land on a specific page/post of your blog. And if the reader likes the post, he/she will definitely search for similar topics on the blog, and this is exactly where, labels and categories will help the visitor. But again, the number and names of the labels are very important. 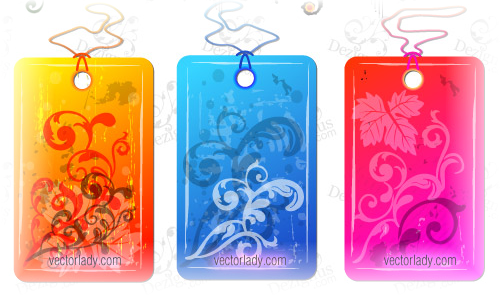 May be, initially you would not have given enough importance to these labels. And now when you realized the importance, you may find tens and hundreds of posts in your blog with improper labels, which need to be edited, or you may even want to delete some of the labels you have already added, or you may want to add some new labels to your previous posts. Blogger does help you to do this quite easily, but I still think that they should make it even more better ! 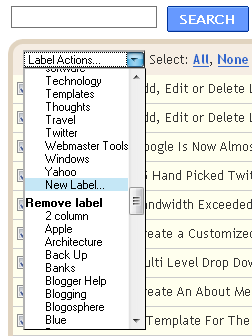 Anyways here's how you can edit, add or delete labels in Blogger. 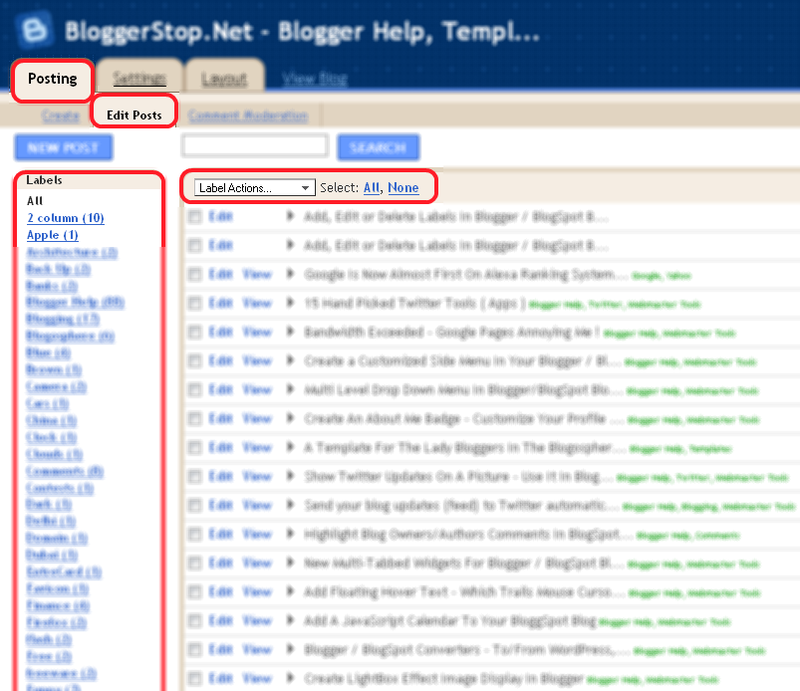 Log in to Blogger, in the Posting section, click on Edit Posts. See the highlighted regions in the image above. As soon as you click on Edit posts, you will see all posts written by you (select posts per page as 300 in the right corner of the page). 1. Now to delete any label, click on "Select All". Then in the drop down menu "Labels action", under "Remove label" option you will see the list of all labels, click on the one, you want to remove for ever. 2. To add a label, select all the posts, you want to add the label. Then in the drop down menu "Labels action", under "Apply label" option click on New label.... Finally enter the name of the new label. 3. And in case you want to edit a label, unfortunately there's no direct option given by Blogger. So do this, firstly in the list of labels column, present at the left side of the page, click on the label you want to edit. Now only those posts are displayed which have this label. Now add a temporary label to these posts. Then delete the label, you want to edit. Now click on the temporary label in the labels list. Now add the new label. Then finally delete the temporary label. Next Next post: Getting original xp key from pirated XP CD! !